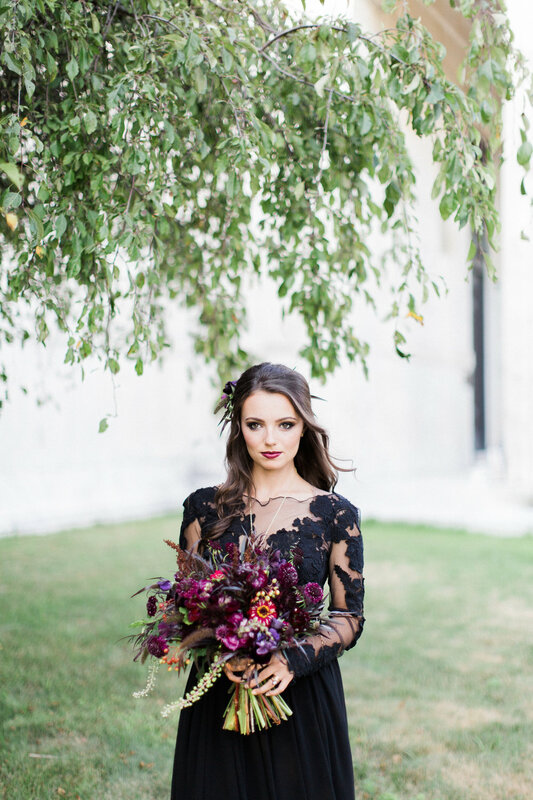 The timeless verse “Until death do us part” was a natural title and theme for this dark and beautifully intriguing fall themed photo shoot for all those moody themed brides out there. As our natural title for the shoot, it’s only fitting to have signage made with gold metallic calligraphy and wine colored watercolor designed by the talented company Sable & Gray. 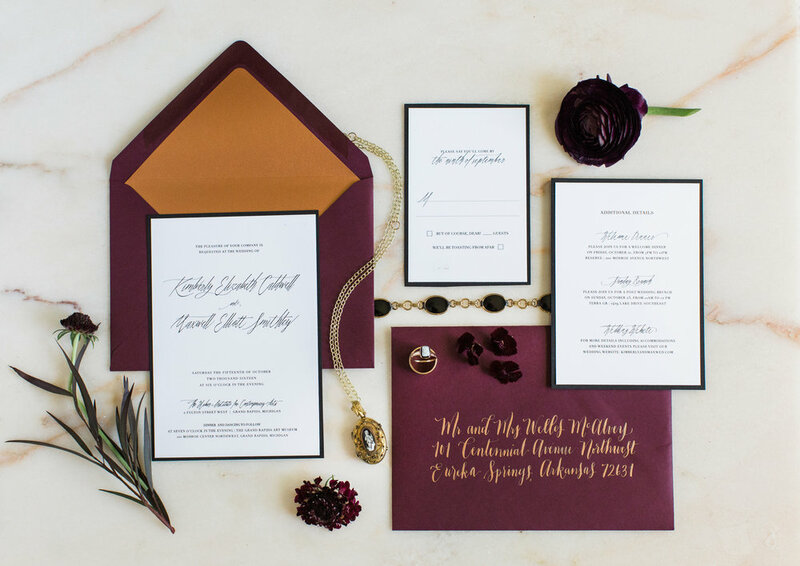 Matching the wine colored calligraphy, Centennial Avenue created gorgeous stationary invitations to fit the shoot's look and feel. 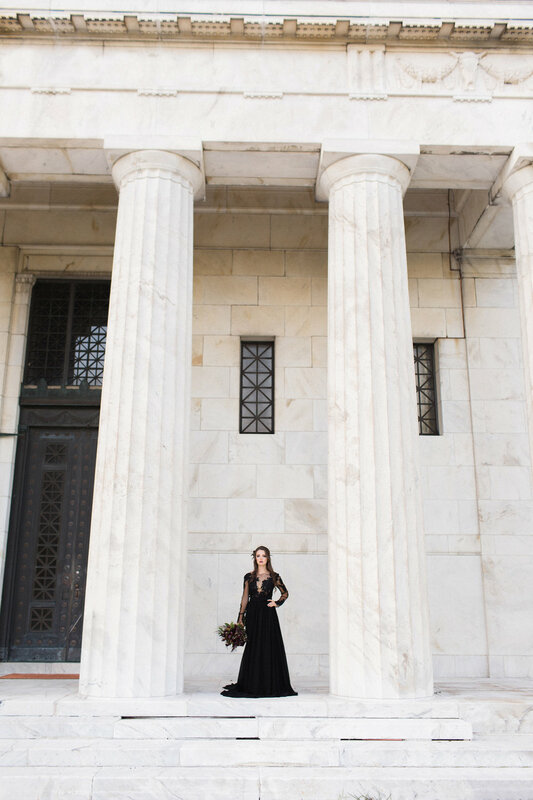 When you find out the location is at a Mausoleum you can’t help but be excitingly entranced by the images that would be captured by Tifani Lyn Photography. Using a combination of mixed mediums of film and digital photography and a bit of videography is not seen very often and we are excited to share her imagery! In researching upcoming runway fashion for 2016 and 2017, we wanted to stay ahead of trends that are starting to make its way in the wedding market. Influenced by fashion designers Ellie Saab and Zuhair Murad with gorgeous black Avant Garde wedding gowns. 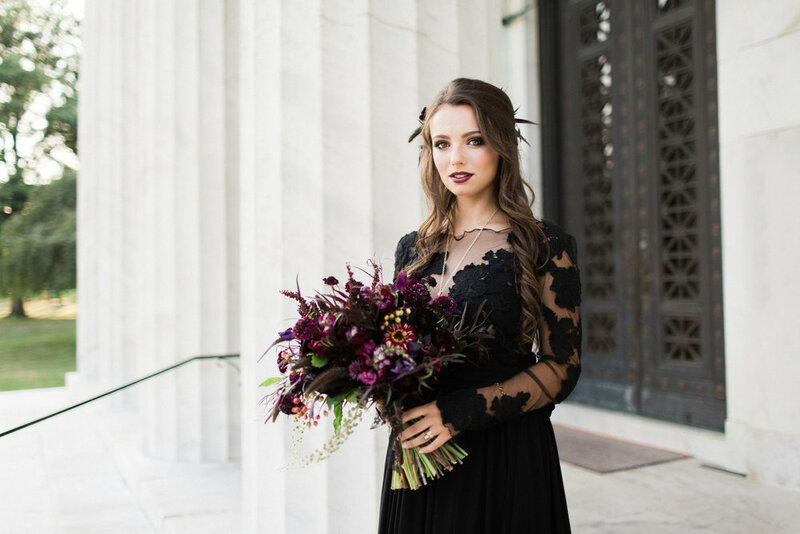 While searching for such a gown to get ahold of, with a similar couture style we found the very talented Sweet Caroline Styles on Pinterest and we are so happy we did! Caroline’s beautiful 2-piece wedding gowns are absolutely stunning! With a black lace top and long flowing couture chiffon skirt, her black bridal collection does not disappoint. Keeping the hairstyle mostly down to show off her beautiful long brunette hair, hair stylist Krystle of Krystle Waivio Hair, curled the hair in sections, leaving the ends out to create an organic and lived in feel. Then loosely twisted and pulled out pieces back and to the side, giving the beautiful floral hairpiece an anchor to secure to. All while using product from Neuma beauty, an organic, vegan and echo friendly hair product line. The stunning makeup designed by Lisa owner of Wonderfully Made Makeup, used a metallic gunmetal shade on eyelids that she paired with an espresso brown to create dark, sultry eyes. For the face, a light layer of airbrush makeup created a natural base with slight contouring of model's features. A metallic berry color was applied to cheeks. Then finishing the look with a deep, matte plum lipstick, similar to the model's hairpiece, complementing the theme and bridal colors. Finalizing the brides look was all about the accessories! Georgian Era jewelry from a new business called Fox Haven Jewelry specializes and preserves Georgian Era jewelry. Pictured is the Channing necklace, the Brixton ring, the Delling ring and to finish the look the Fairfax bracelet. 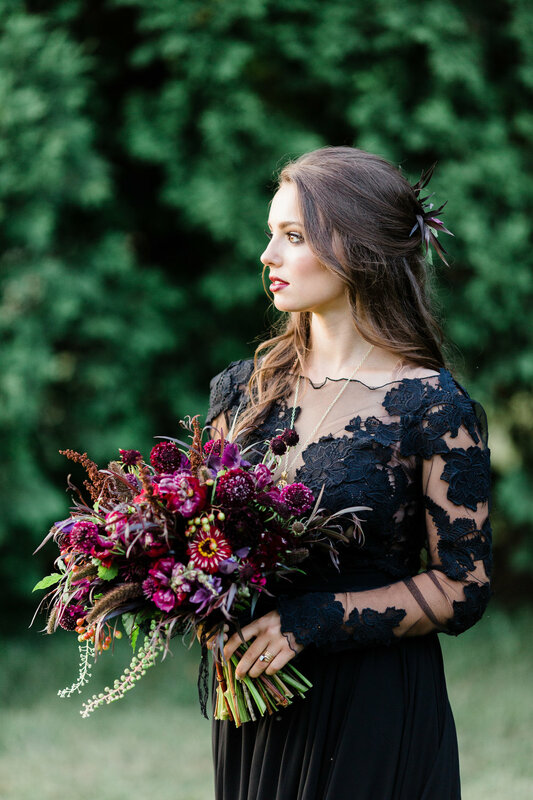 Inspired by the beauty of the black lace 2-piece bridal wear, it’s easy to see where florist, shoot coordinator and writter Alyssa, owner of Fleurology Designs envisioned dark, rich, berry and plum hues that transpired the beautiful flowers used in the bridal bouquet, hair piece and end table florals. My goal was to use as many dark and enticing products as possible attracting your site from afar with still more depth to be seen up close. 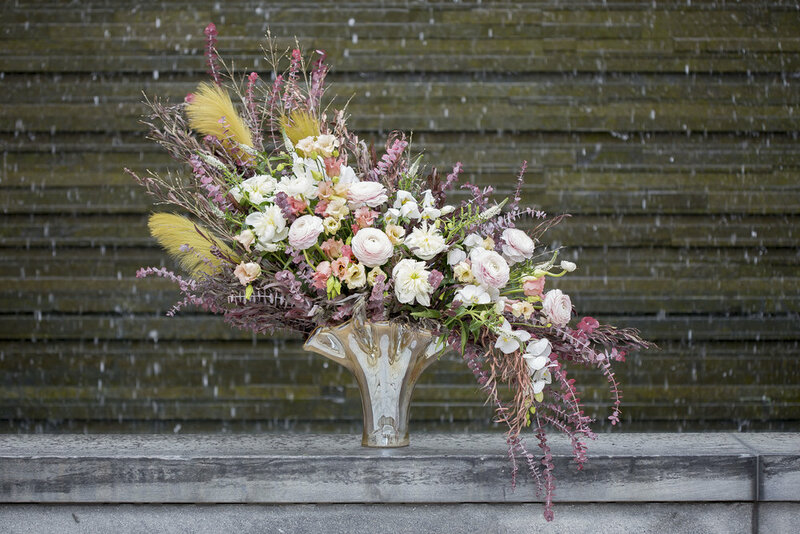 Layers and textures are the main applications used in the bridal bouquet with the standard European hand tied technique. Using mostly locally grown and foraged flowers and foliage’s. 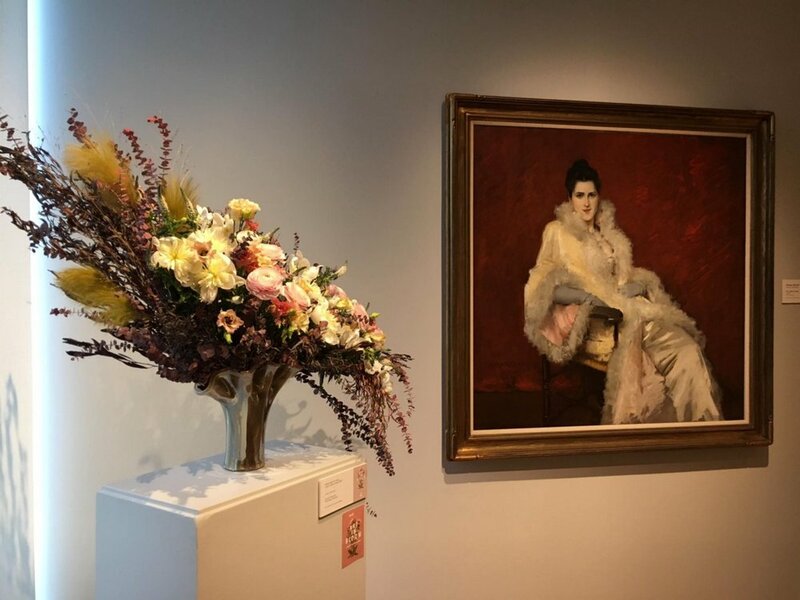 Flowers used are dahlias, scabiosa, ranunculus, sweet peas, zinnias, snapdragons, sweet william, cockscomb celosia, two different varieties of millet, pokeberry, viburnum berry and agonis. The chaise and marble side table is a product from Fancy Frey vintage furniture rental company. On top of the marble side table, is vintage china, silverware, glassware and a petite vase is owned by Gigi and LaClede. 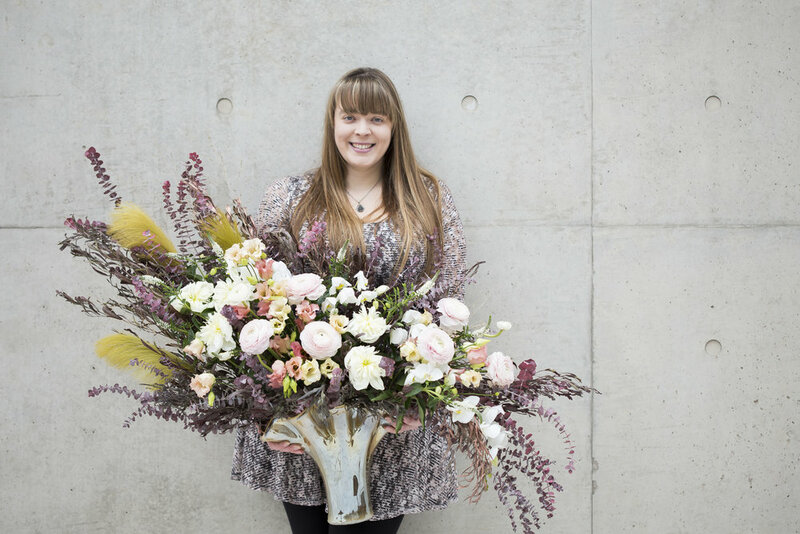 They have a large and varying selection of antique and vintage china and vases available for events. Decorating the glassware is a red sauvignon blanc served with delectable locally grown dark cherries, grapes and specialty chocolates made by the local chocolatier Mokaya. Their chocolates with wine is pleasing for all palettes. 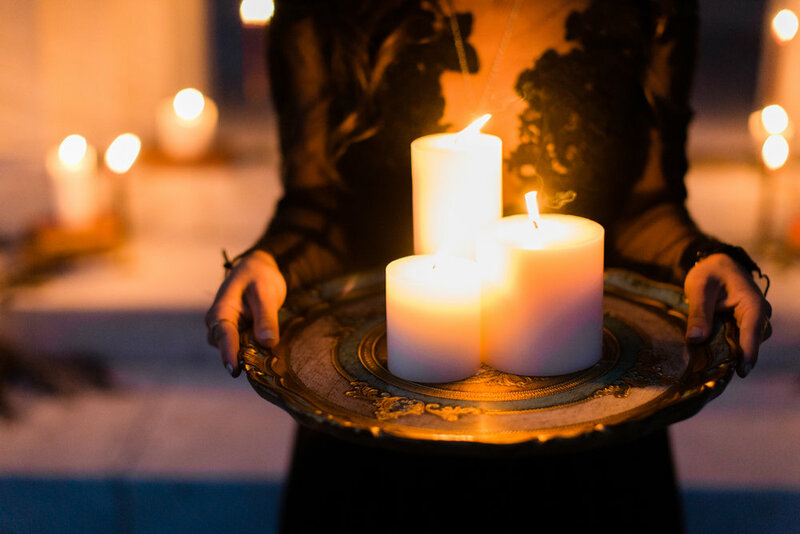 The last part of the shoot was decorated with pillar candles, marsala taper candlesticks, old books and agonis foliage along the mausoleum steps to bring out the evenings light and shadows through candlelight. As we conclude the shoot we hope the quotation by Rumi, “Both light and shadow are the dance of love” will remain in your thoughts as you have looked through the images. A huge hearted thank you to all of the vendors involved! This photo shoot was definitely unique and one of a kind. It takes a lot of trust and faith in our vision that in the end it will turn out beautifully, thank you for your trust! Head on over to WeddingDay Magazine to see our blog post, more images and even a video from Tifani Lyn Photography!